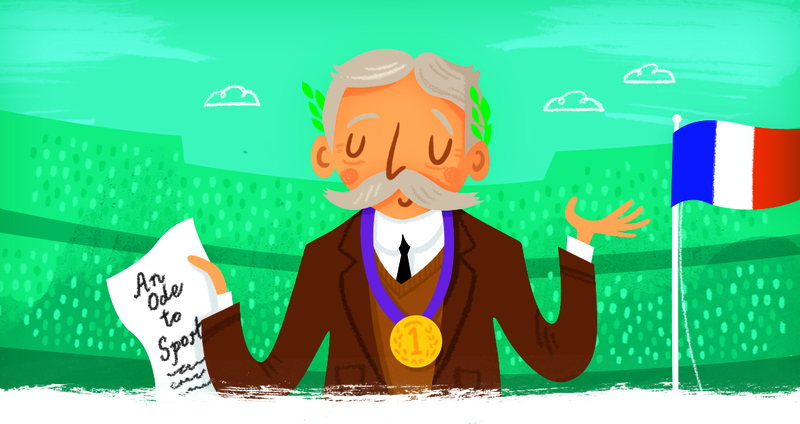 Pierre de Coubertin (Pierre Fredy, Baron de Coubertin – to give him his full title) is deservedly one of History Heroes’ 40 greatest characters in our SPORTS HEROES card game. He played a key, founding role in the revival of the modern, and first, Olympic Games in Athens in 1896. He also has the distinction of being born on the 1st January (1863), so his inspiring story is a perfect way to start the New Year. Born in Paris into an aristocratic family in 1863, Pierre de Coubertin was a talented sportsman, historian – we definitely like him! – and educator, who passionately believed in the power of sport to develop the mind and educate young people to work towards a better world. In 1890 Pierre de Coubertin met a fellow educationalist, William Penny Brookes, who had organised the British Olympic Games as early as 1866. Brookes had a vision for an international Olympic Festival and Pierre de Coubertin determined to make that vision come true. 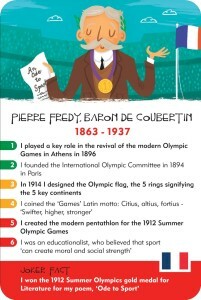 De Coubertin founded the International Olympic Committee in 1894 in Paris and. only two years later, the first modern Olympic Games took place in Paris in 1896. The first few Olympic Games were definitely ‘works in progress’ as the IOC got to grips with the huge demands of the Games. By 1912, in Stockholm, the Olympic Games had taken a recognisable, successful and international shape. Pierre de Coubertin introduced the modern Pentathlon at the Stockholm Olympics and in 1914 he designed the 5 ringed Olympic flag as we know it today. 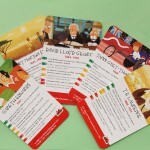 He also coined the Games’ Latin motto: ‘Citius, altius, fortius’, which means ‘Swifter, higher, stronger’. 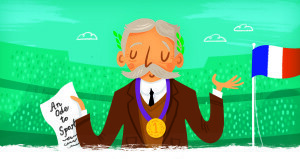 Very cleverly Pierre de Coubertin also managed to win an Olympic gold medal by winning the 1912 Olympics gold medal for…Literature with his poem, ‘Ode to Sport’! Even more poetically, when Pierre Fredy, Baron de Coubertin died in 1937, his heart was laid to rest in Olympia, Greece following his last wishes. 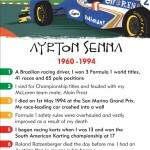 Have a look at his card to learn Pierre de Coubertin’s key facts . 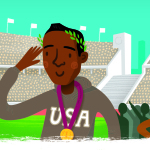 You’ll soon be ready to play History Heroes: SPORTS HEROES!